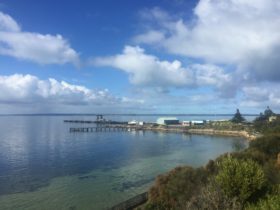 You’ll find the Ozone Hotel on the foreshore of Kingscote, the largest town on Kangaroo Island, South Australia. 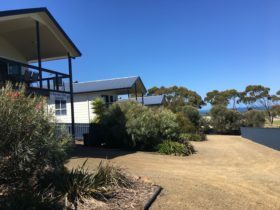 Located in the heart of the town and surrounded by stunning costal scenery, Todd Mall is just around the corner with some of Kangaroo Island’s most well known attractions within walking distance. Relax and enjoy the outdoor pool, sauna, barbecue area and free wireless internet access. Zone Restaurant, located on site, offers magnificent views of Nepean Bay. 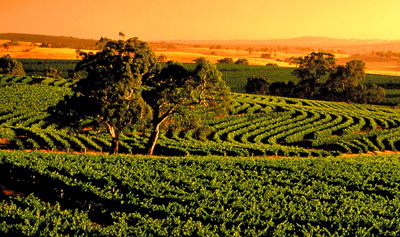 It showcases a variety of dishes providing more opportunities to sample the best of Kangaroo Island produce. Ozone Hotel features two private function rooms, ideal for your next event, small wedding or corporate dinner. The Seal Bay Room and Nepean Bay Room both have access to the private Emu Bay Bar and lounge area suitable for pre-drinks and canapés. With thousands of possibilities from action and adventure to relaxation and luxury, or perhaps a mixture of both, consider Kangaroo Island for your next holiday. Standard Rooms are the lead-in room type at the hotel. Located on the second floor of the Chapman Building, Standard Rooms all enjoy an ensuite bathroom and comfortable double bed. With hotel facilities close by you’ll enjoy easy access to all facilities including free wi-fi. Some rooms may consist of one double and one single bed suitable for up to three people. Situated on the ground and first floor of the Chapman Building with either a shared balcony or outdoor terrace area, our Poolside Family Rooms overlook the pool and barbecue area. Perfect for families, all rooms feature a queen and two single beds complete with ensuite bathroom. Suitable for up to four people. Our Executive Rooms are modern, spacious hotel-style rooms located on the ground and first floor of the Flinders Building. Executive rooms are accessible by lift, all feature an ensuite bathroom and consist of either one king bed or one king and one single bed configurations. Situated opposite the Chapman Building, all hotel facilities are a short distance away. Disabled access rooms available. Suitable for up to three people. 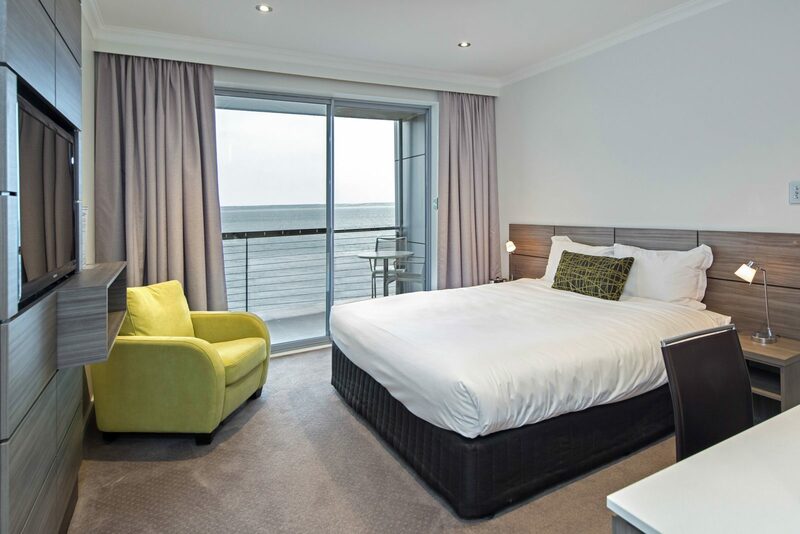 Upgrade to our Executive Sea View Room, located in both the Chapman and Flinders Buildings. Relax and unwind with stunning sea views over Nepean Bay and Kingscote Wharf from your balcony or private terrace. 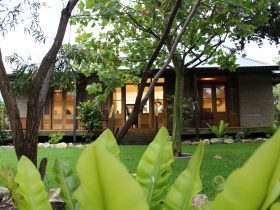 Situated on the ground and first floor, all rooms feature a king bed and ensuite bathroom. Many also have an additional single bed, if you require a twin or triple share. Suitable for up to three people. Situated on the ground floor of Pier Apartments, our Deluxe Suites are un-serviced and self-contained. 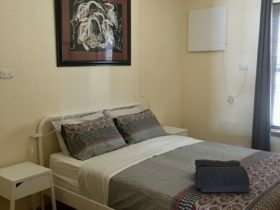 Suites boast basic cooking facilities, a full laundry, shower ensuite as well as living area with couch, television, DVD player and stereo/CD player. Our suites feature unique and quality furnishings, a king or double bed with linen provided. Suitable for two people. Situated on the first floor of Pier Apartments with sea views. Our un-serviced, one bedroom apartments have an open planned living/dining area with fully equipped kitchen and ensuite bathroom with spa bath. 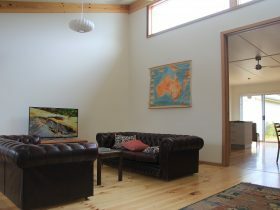 Apartments have a couch, television, DVD player, stereo/CD player, private balcony with outdoor setting. Main bedroom features a king bed, linen provided, with a fold out sofa bed in the living area. Suitable for two to four people. Spacious Two Bedroom Townhouse, spread over three levels with modern furnishings, features one king size and one double bed, two spacious living areas with sofa bed, dining area, fully equipped kitchen and laundry, main bathroom with shower and ensuite bathroom with corner spa. A private courtyard complete with barbecue is accessible in addition to the generous balcony that offers views of Nepean Bay with outdoor setting. Suitable for up to six people. A little bit of luxury spaced across three levels, our self-contained, un-serviced, three bedroom townhouse consists of one king, one double and one single bed. The first level features a laundry, living area with sofa bed and access to the private courtyard with barbecue and outdoor setting. The second level is complete with a full kitchen, living/dining area opening onto a spacious balcony with views over Nepean Bay, two bedrooms and main bathroom with shower. The third level is the master bedroom with private balcony and ensuite bathroom with corner spa. Suitable for up to seven people. 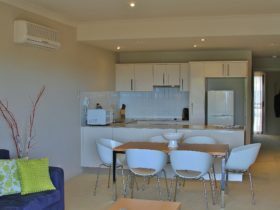 Our Spectacular Two Bedroom Penthouses are located in the Flinders Building. All are uniquely furnished consisting of two bedrooms with king beds which can be split into two singles, lounge, dining, one ensuite bathroom with corner spa and main bathroom with shower, full kitchen facilities. The private balcony has picturesque sea views over Nepean Bay and Kingscote Wharf. These rooms are accessible by lift. Suitable for up to four people.